Many Americans captured by the Japanese during WWII were airmen from ill-fated missions of B-24 Bombers. The aircraft was known as the Liberator. Their captors considered these men as slaves rather than Prisoners of War, and they subjected these men to an inhumane and brutal existence. The scars the POWs received, both physically and emotionally, were severe, and the emotional shackles would, for many, take years to break. BREAKING LIBERATOR’S SHACKLES the main character, Grant Metzger, has coped with his post-war shackles by trying to forget. 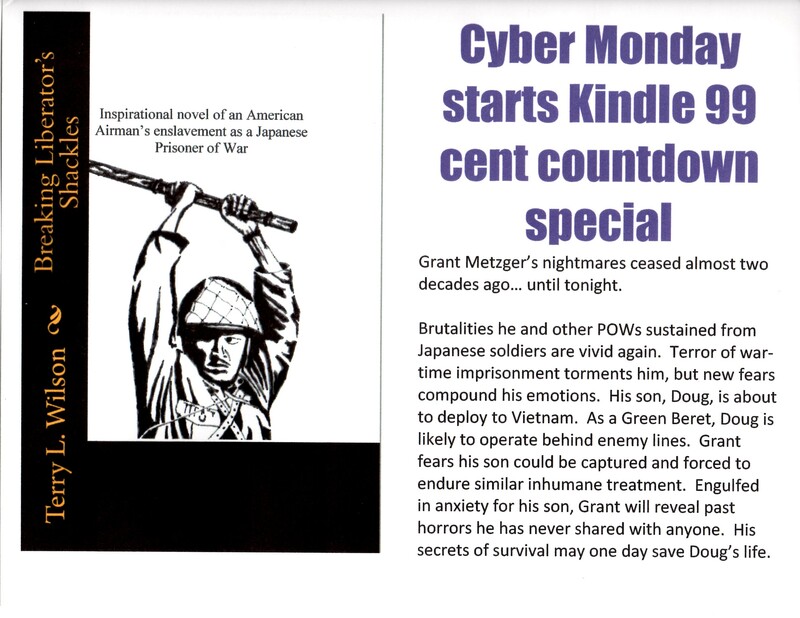 When his son Doug, a Green Beret, receives orders to deploy to Vietnam, Grant’s terrors of his own past resurface. His concern and love for his son ignites fears. 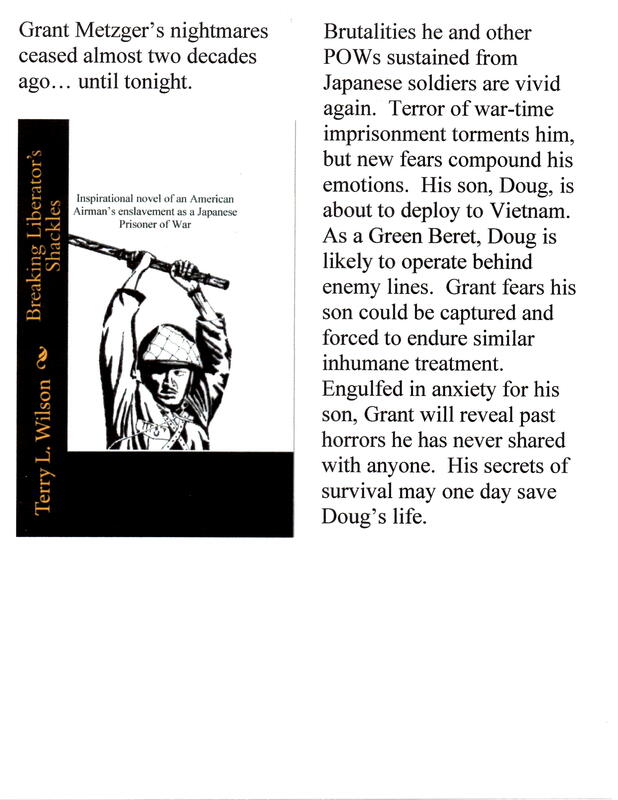 By reliving his own story to his son, could he provide Doug a perspective that might help him survive should he be captured by the Viet Cong? Grant, for the first time following his release, tells his story, and in doing so breaks his shackles. 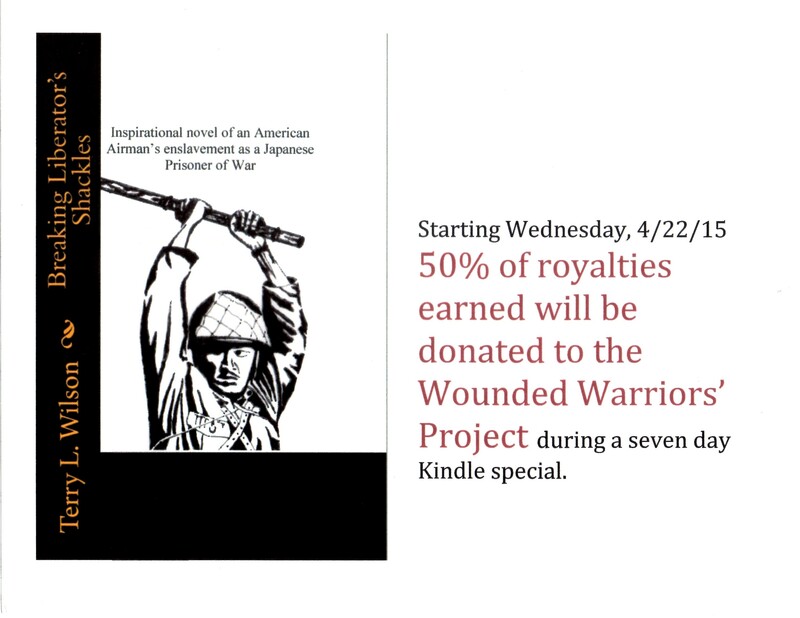 I hope you will take advantage of the special and enjoy the read. Please visit my site at http://terrywilsonsite.com or my Facebook page at www.facebook/TerryLWilsonAuthor. Leave a comment should you care to. I have come to know many other authors through the use of the electronic media (most I have never met), and each of us typically read and write reviews for the other authors’ work. When we write reviews, we have an ethical standard of how we will write our reviews. I typically will only place a review for work that I consider excellent or exceptional (I don’t wish to saddle another author with a review that may hurt their sales). Some are brutal, but fair, when they post. The story centers around the dad, Grant Metzger and his son Doug. Grant was a B-24 Liberator co-pilot during WWII in Burma. His son, Doug is home on leave before being sent to Vietnam. Grant has never talked to anyone about the seventeen months he spent in a Japanese Prisoner of War Camp, but with son preparing to depart to the theatre he served in, it’s time for the story to be told. The last chapter of the book will have many who served, shedding a tear as the family attends a home game football game where Doug and all those served, is going to be honored. Excellent touch! Another excellent touch of the work is Grant’s undying relationship with God. He makes no bones that his faith allowed him to not only survive the cruel treatment of his captors, but was the backbone of continual existence. At one point Doug asks Dad why didn’t refer to the enemy as Japs or Nips. Because of his steadfast faith and eyewitness account of man’s cruelty to man, he vowed never to belittle any race of people as long as he lived. A trait he passed on to his son and daughter. We need more of this type of thinking and behavior today instead of political correctness! This story is an excellent companion to “Unbroken,” by Laura Hildebrand. Bottom line, there are no con’s to this excellent work. I am happy to state that at approximately 11:30 this morning, BREAKING LIBERATOR’S SHACKLES was listed as number eighteen on the Kindle Bestseller List for Historical Japanese Fiction. I have my fingers crossed it will move up on the list and make it to the list for all Historical Fiction. 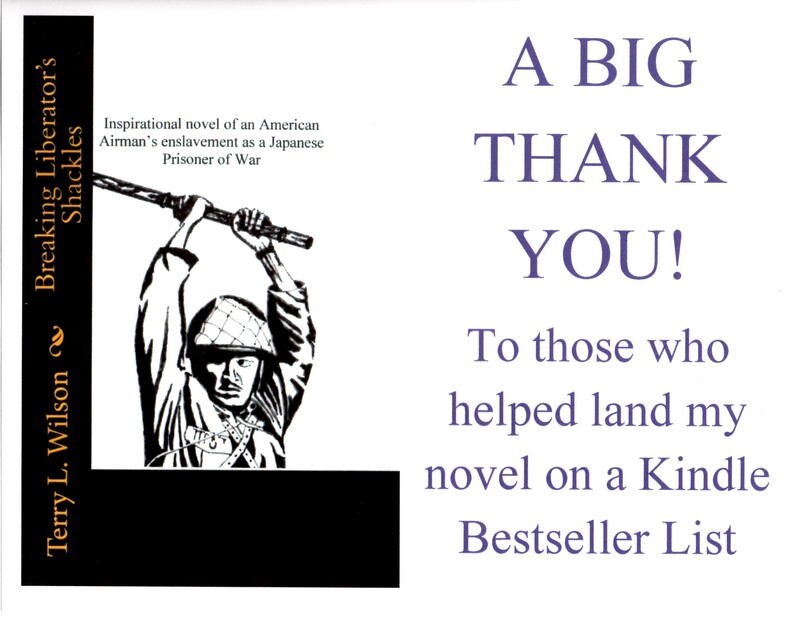 I extend a warm thank you to each reader who helped this novel achieve success. 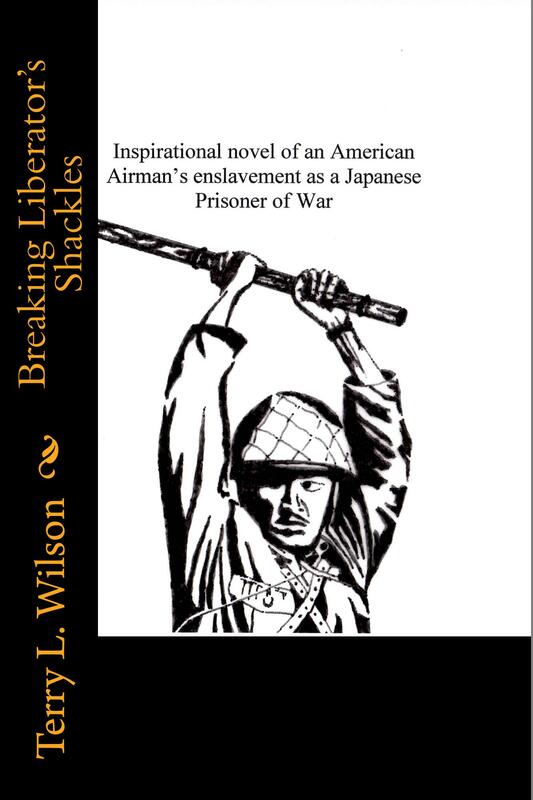 Today BREAKING LIBERATOR’S SHACKLES, an inspirational novel of an American Airman’s enslavement as a Japanese Prisoner of War, started a 99 cent Kindle Countdown Special. The price will increase to $1.99 at 2:00 PM (EST) on Wednesday, $2.99 at 8:00 PM (EST) on Friday and return to the listed price of $4.00 at 3:00 AM (EST) on Sunday the 7th. of December. The entire review my be read on the “Media Review” page of my site.